Advocate Staff Photo by HEATHER MCCLELLAND -- Shaquille O'Neal and his mother, Lucille O'Neal pose for pictures after a statue of Shaq was revealed during a ceremony on LSU's campus in September 2011. The statue is located at the entrance of the Pete Maravich Assembly Center practice facility. Undated original staff photograph by LEATUS STILL -- Pete Maravich, one of Louisiana's Top 25 most outstanding athletes of the 20th century. 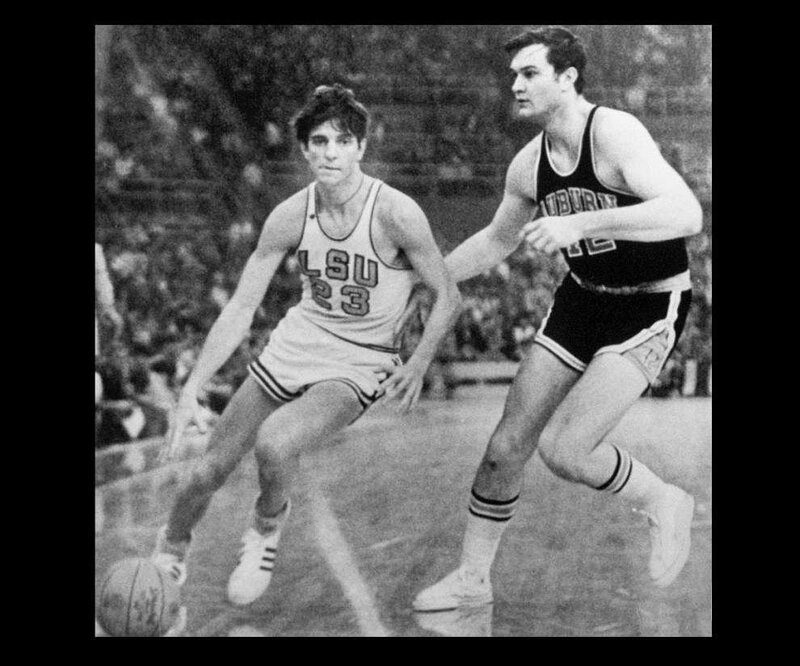 Jindal to LSU: How about a statue of Pete Maravich? Twenty-six years after he died, Pistol Pete still has a fan following. Count Gov. Bobby Jindal among the adoring crowd who wants to be able to take a selfie with Pete’s likeness on the LSU campus. Jindal gave LSU a pointed nudge Thursday, asking on his official letterhead why a statue of Pete Maravich doesn’t stand outside the Assembly Center that bears the basketball legend’s name. “This would be an appropriate way to memorialize such a significant figure in LSU and Louisiana history, and I offer my full support of such a project,” the governor wrote in a letter to the LSU Board of Supervisors. Jindal sent copies of the letter to LSU Athletic Director Joe Alleva, LSU system President and Chancellor F. King Alexander and members of the LSU Hall of Fame Committee. The governor offered no suggestions on how the statue would be funded. Lanky with socks that tended to flop around his ankles, Maravich still ranks as the leading NCAA Division I scorer with 3,667 points. He scored those points while playing for LSU. He spent hours perfecting his craft, played for the New Orleans Jazz, the National Basketball Association franchise in the late 1970s, and died at age 40 of a heart defect. The Assembly Center on LSU’s campus is known as the house that Pete built. Construction was completed not long after Maravich joined the NBA without graduating from LSU. After Maravich’s untimely death, the Assembly Center became the Pete Maravich Assembly Center. His name — in all caps — graces the circular building. 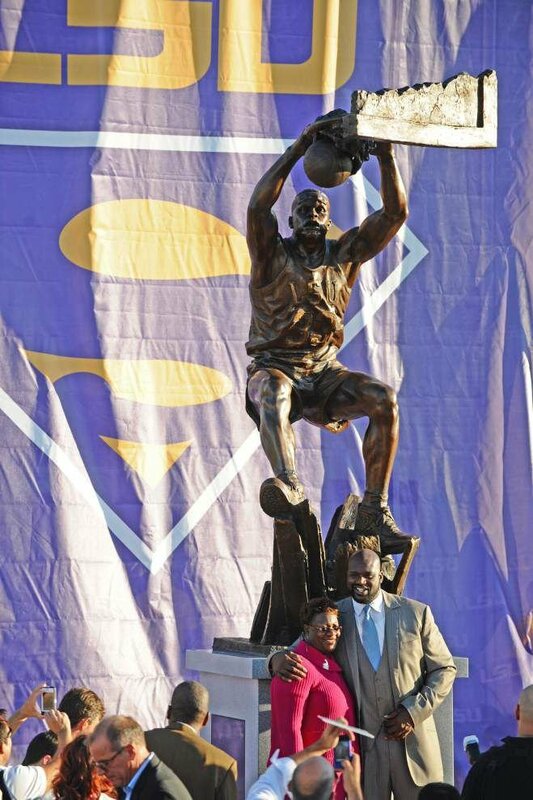 A few years ago, LSU unveiled a statue for former LSU star player Shaquille O’Neal. The statue is on the west side of the Assembly Center. A statue of the school’s mascot, Mike the Tiger, also decorates the grounds of the Assembly Center. Children climb onto it for photo opportunities. But nowhere is there a statue of Pistol Pete in his floppy socks. Some fans complained when the O’Neal statue went up, not because they had anything against the 7-foot-1 superstar, but because they felt Pistol Pete had been forgotten. LSU’s response to fans’ protests was that O’Neal graduated from LSU and young recruits know who he is. Former LSU basketball coach Dale Brown said Thursday that it’s best not to get caught up in creating memorials. He said he’s not big on erecting statues or putting names on buildings even through Maravich was a dear friend. Maravich’s widow, Jackie McLachlan, feels differently. She holds season tickets to the LSU men’s basketball games. She said she wishes there was a statue every time she sees a fan struggle to get the Maravich name on the Assembly Center into a camera frame. McLachlan said promises were made years ago that a statue would be put up in her husband’s memory. She said it would mean something to the fans, not just to herself and her two sons. “That would be a good tribute. Gov. Jindal has been kind enough to try and get this moving forward,” McLachlan said. Alexander said there is a formal process through which campus statues are approved. He said the Maravich statue hasn’t gone through the first step of being introduced to the Hall of Fame. Formal process aside, Alexander said he isn’t opposed to a statue even though he notes that LSU’s basketball team plays in a building that bears Maravich’s name. Jindal made it clear that he wants the process to start moving forward. “Pete’s lengthy list of awards and records set on the court while playing both at LSU and in the NBA make him one of the most notable players in sports history. … He is also one of the youngest players inducted into the Naismith Memorial Basketball Hall of Fame, and was cited by the Hall as ‘perhaps the greatest creative offensive talent in history.’ He is truly an LSU basketball legend,” the governor wrote. Elizabeth Crisp of the Capitol news bureau contributed to this report. Follow Michelle Millhollon on Twitter, @mmillhollon. For more coverage of Louisiana government and politics, follow our Politics Blog at http://blogs.theadvocate.com/politicsblog.